George (KB9RZQ) showing a finished antenna to the group. 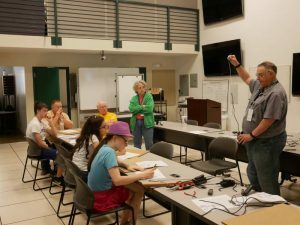 For the June Castlemakers Kids meeting we built an emergency radio antenna out of coax cable. Since it was ARRL’s Field Day, an annual ‘dust off the radios & get on the air’ event, we relocated our meeting to Putnam County’s Emergency Operations Center (EOC), where some local amateur radio operators were seeing how many radio contacts they could make. 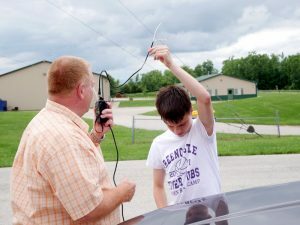 It also gave everyone a chance to see amateur radio operators making on air radio contacts and then try out the built antennas. Testing a newly built antenna in the parking lot. The design uses a short piece of coax cable with a connector on the end, you can see the instruction sheet we made and an example antenna. It’s a simple design that works quite well by cutting a different cable length for different transmission frequencies. Just strip the wire and twist the coax braid then you’re done. The antennas were then hooked up to a radio, and with a licensed radio operator supervision, they tried their antenna, some inside the building and others in the parking lot, to talk to each other. Of course making antennas and watching radio operators ‘work the grid’ raised lots of questions. Thanks to George Edenfield (KB9RZK) and the rest of the PCAUXComm crew for hosting us. And special thanks to Dave Costin for giving us a behind the scenes tour of the Putnam County EOC – lot going on there many don’t realize.